A pair of idiot would-be thieves in Carroll, Iowa, learned the hard way that real crooks use actual stockings on their heads - not Sharpie markers - for a reason: They don't look quite as stupid when caught. Last Friday night, the police department in Carroll, IA received a call that two men had attempted to break into a home. After stopping a vehicle that matched the caller's description, they found two would-be crooks who didn't quite have the "sharpest" of disguises. Instead of going with ski masks, balaclavas or stockings pulled over one's head, 23-year-old Matthew Allan McNelly and 20-year-old Joey Lee Miller had drawn makeshift masks all over their faces with markers - permanent markers. Seeing as how the benefit of a normal mask is that it A.) provides anonymity and B.) can be easily concealed or discarded, one might imagine that going with a method of disguise that actually adds identifying features until you scrub your face raw was a rather poor choice. And one would be right. Carroll Police Chief Cayler said as much, anyway. "[The] black faces gave them right away ... I have to assume the officers were kind of laughing at the time. I've never heard of coloring your face with a permanent marker." The pair had been intoxicated, said Cayler, and explained that the police believed Miller and McNelly had targeted the house in question because one of the accused bungling burglars suspected that his girlfriend was cheating on him with the man who lived there. "They probably were just not thinking straight and figured we'll go out and scare the guy or whatever," said the Chief. "[They were] being dumb and combine that with alcohol and it was the perfect storm." Try watercolors next time, guys. 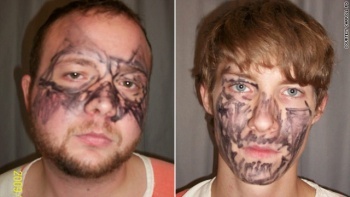 It probably won't actually work any better, but at least you'll look more like an Impressionist painting than two drunk dudes scribbling on each other's faces with a marker.